I studied art at the Museum School of Fine Arts/Boston and The Art Institute/ Boston as well. I have also taken courses in painting at Mass College of Art . I have shown locally and had a studio in the Fort Point Channel area before moving to New Hampshire in 1992. While there I was on the board of the River Gallery School of Art in Brattleboro, Vt. and was a member of the Windham Art Gallery. 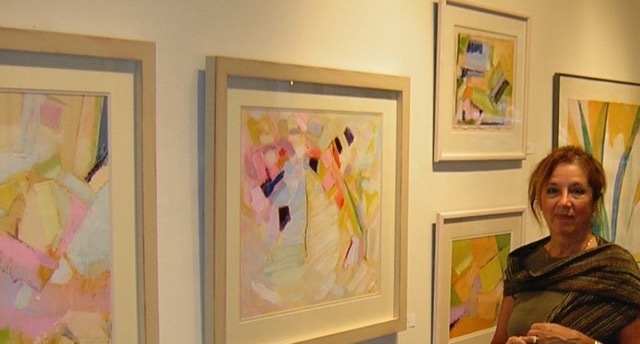 My work is in many private collections and I’ve shown locally and throughout the Northeast. It is a pleasure to be able to make visual art in a committed way at the Vernon Street Studios in Somerville. I am a member of the Cambridge Art Association. My work is at times figurative. I also like painting still lifes and landscapes, but often choose to work abstractly, luxuriating in the paint with attention to form, line and color. The grids of artists such as Sean Scully, the geometry of Richard Diebenkorn and the still lifes of Georgio Morandi are very attractive to me. The challenge for me is to stay with my passion and not be afraid to sacrifice the whole for the part, because often, only then do I discover that the part must be sacrificed as well. If it becomes too precious, balance can be lost. It is akin to seeking that sweet spot in a game of tennis. The passion and challenge become intertwined and a resolution is sought in the paint.